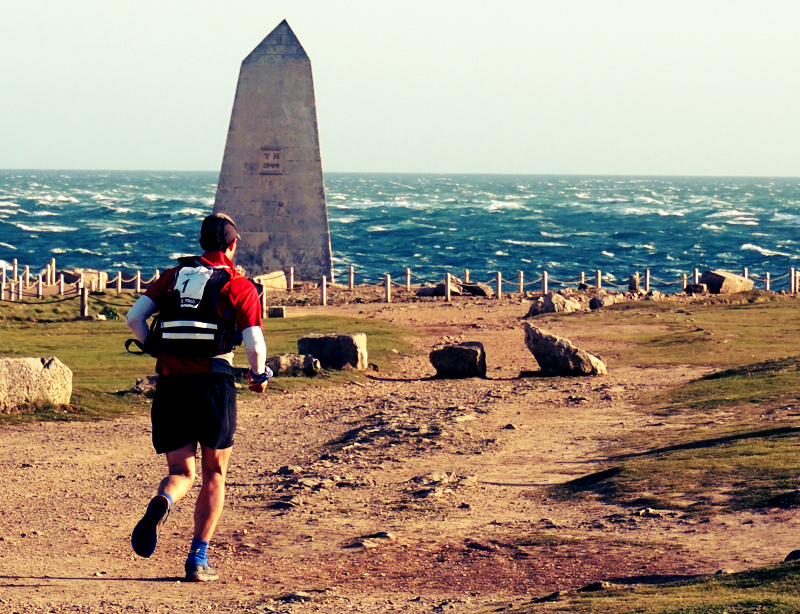 The Oner is a coastal ultra comprising of three back to back marathons (around 80’ish miles in total) along the Jurassic coastline following the South West Coastal Path. Competitors have 24 hours to complete which has a typical finish rate of only 50%. It was my first long distance coastal run and after a weekend recce of the second half of the course in stormy conditions a month ago, I can’t say I was totally looking forward to the experience having had a little taste of the hills! My logistics saw me take a train to Weymouth on the Friday afternoon where I met up with Keith Godden for a pre-race drink and chat the night before the race. Fitness wise, I’ve banked lots of miles this year (the good) but haven’t quite done the longs runs or the quality sessions (the not so good). So an honest appraisal of my fitness was ok overall but could be better. Putting my back out a week before the race trying lift some heavy tables didn’t help either! (Bend the knees man.. bend the knees). I was looking forward to getting an early night having been woken very early that morning. Unfortunately I had to change rooms at the hotel I was staying at early evening due to noisy guests directly above me and didn’t get to sleep until 11pm and then woke at 5am on the Saturday as I don’t usually sleep that well in unfamiliar territory. You can probably tell I’m getting my excuses in early here! However getting some good sleep is an important part of my preparation and it didn’t seem to be happening here. Keith kindly picked me up in the morning and we were greeted to rain and wind but thankfully this was just some weather passing through and we were promised some good conditions over the weekend. With the recent warm weather, the trail was in pretty runnable condition which was a bonus after some reported poor conditions in previous years. I’ve not participated in a Brutal Events race before, aside from The Oner they largely stage triathlon events and it’s worth mentioning this is a premium priced event. 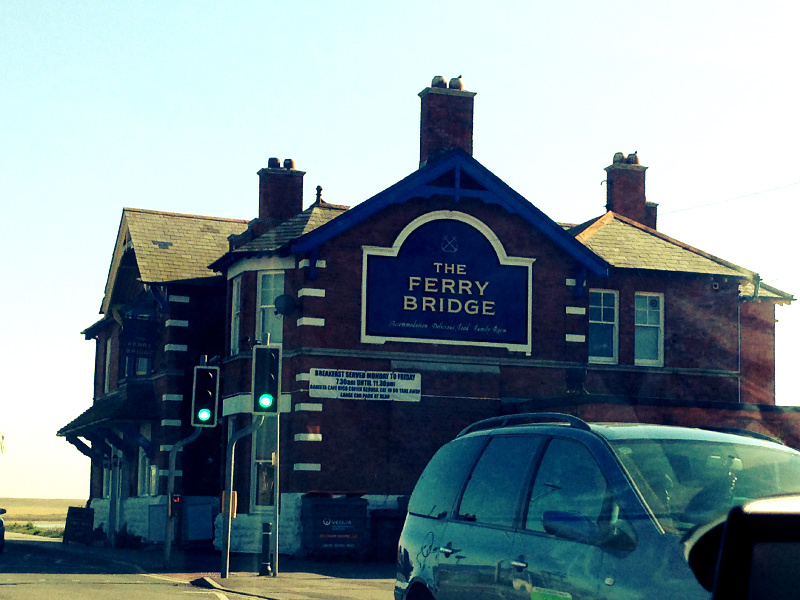 The Race HQ is at the Ferry Bridge Pub which is at the halfway point of the race. Competitors are required to register between 8-10am and are then transported by mini-bus to the start. I caught up with Paul Beechy, Kate Hyden, Kris Duffy and Kelly Lucas at Race HQ before registering. Kit checks and registration are quite thorough (although I couldn’t quite see why a sleeping bag was required if there’s no room at Race HQ to sleep? 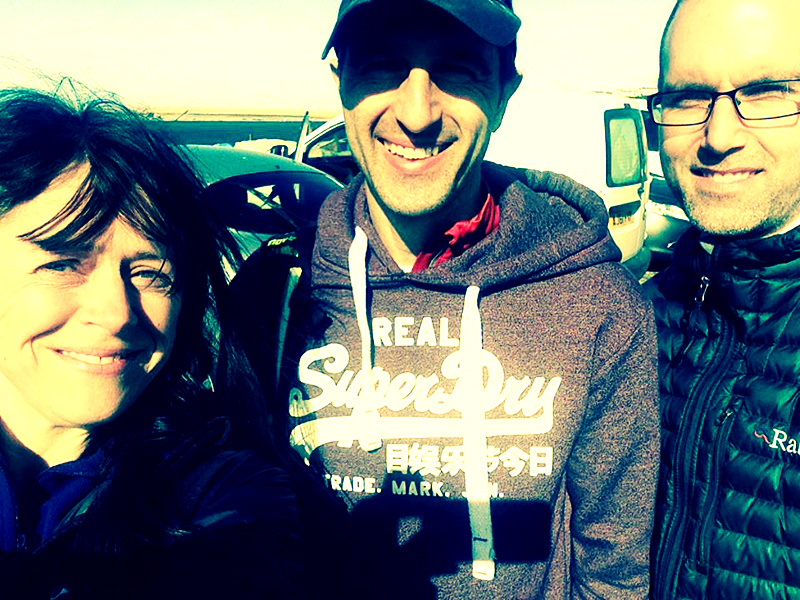 ), the event was also GPS tracked by the Open Tracking system which worked perfectly during the course of the weekend. The race logistics involve competitors running a marathon along the coastline towards the Race HQ then do a half-marathon loop around Portland and check back in at the Race HQ and then have another 40 ish miles towards Swanage and onto the finish at Studland Bay after which you are transported back to Race HQ by mini-bus. There seemed to be a few questions over drop bags but essentially, competitors could have a bag at Race HQ (which acted as CP4 26m and CP6 40m) which contained your sleeping bag and anything you wanted to access at this point. You could also have a second bag which would be marked “for the Finish” which would be taken to the end at some point in the race and which could contain some dry clothes for the end of the race. You could also take a kit bag in the mini bus to the start if you wanted to keep warm and this would be transported to Race HQ (or the end if you wish) which was well thought out. Kit-wise I fitted all the mandatory kit into the Salomon S-lab Vest and left some extra clothes for the night in my drop bag and some dry clothes for the end. My experience of the recce was despite the planned good weather it could get a lot colder when exposed on the cliffs at night. After a 40 minute ride which saw me yawn constantly (getting the excuses in there again) we arrived about half an hour before the scheduled start of the race at 12 noon. We set off promptly at 12 noon in warm sunshine and the first section was a nice taste of things to come with a few early hills. It warmed up pretty quickly when you started running and I witnessed some early kit adjustments with layers being removed. 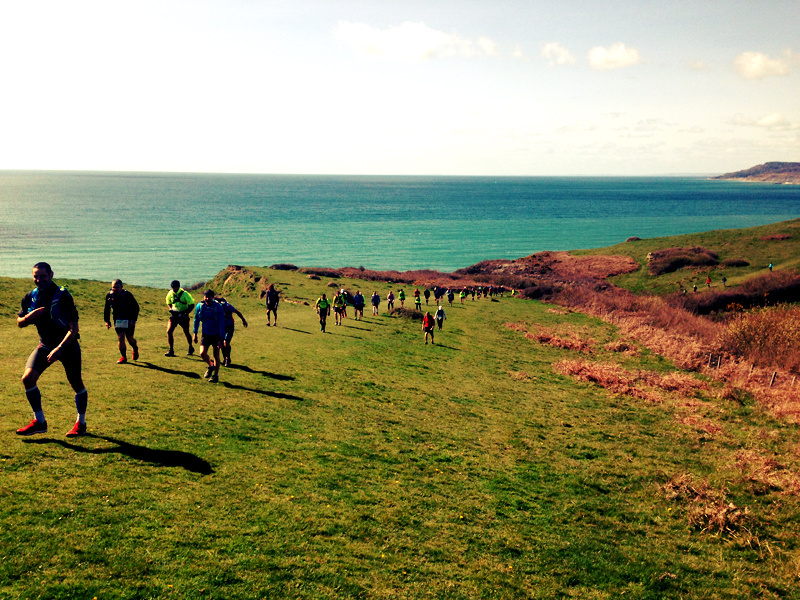 The pack started to spread itself out with a long line of people snaking their way up and down the hills and coastal paths. 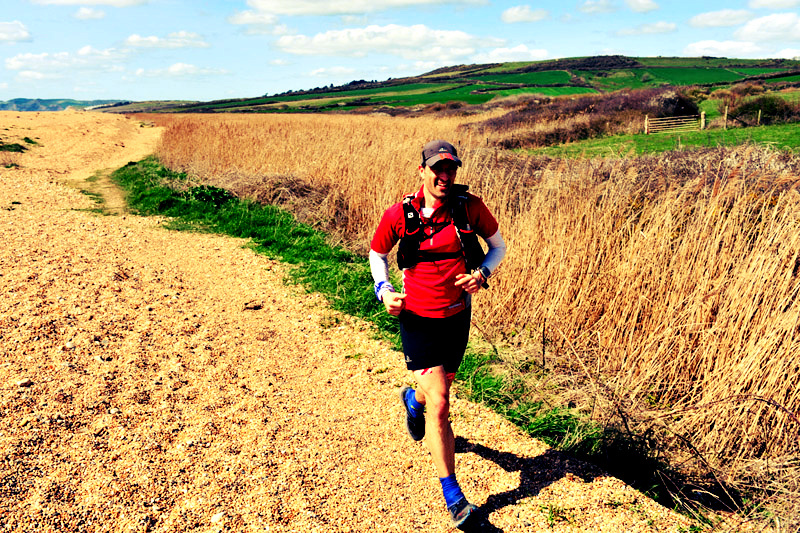 I took it steady with a mixture of running and walking (the hills) and arrived at the first Checkpoint in West Bay where I grabbed a drink, a couple of snacks and moved on pretty quickly. The second and third sections felt much more runnable and I trotted along at a steady pace along the fields, track paths and beaches by myself for the most part. There were a few short stretches of pebbled beach which was harder going (and thanks to Keith for the reminder to wear gaiters). I could definitely feel where I had pulled my back a week ago but this was a mild discomfort overall and didn’t really impact my running. 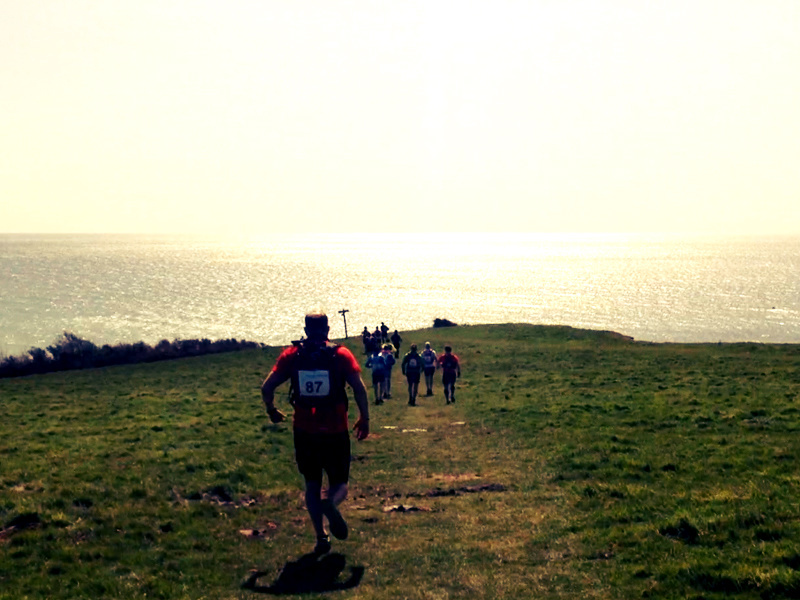 Conditions were pretty much perfect for the event as I headed towards Weymouth and CP4 at Race HQ. I was feeling ok, moving at a steady pace but perhaps wasn’t eating as much as I would normally would at the Checkpoints. There was the usual standard fare of sandwiches, flap jack, chocolate, nuts etc but I just didn’t fancy much at this stage. I was carrying some of my own supplies so wasn’t unduly worried. I hooked up with a chap called Michael around here as we were running at a similar sort of pace and the company helped pass some of the time. 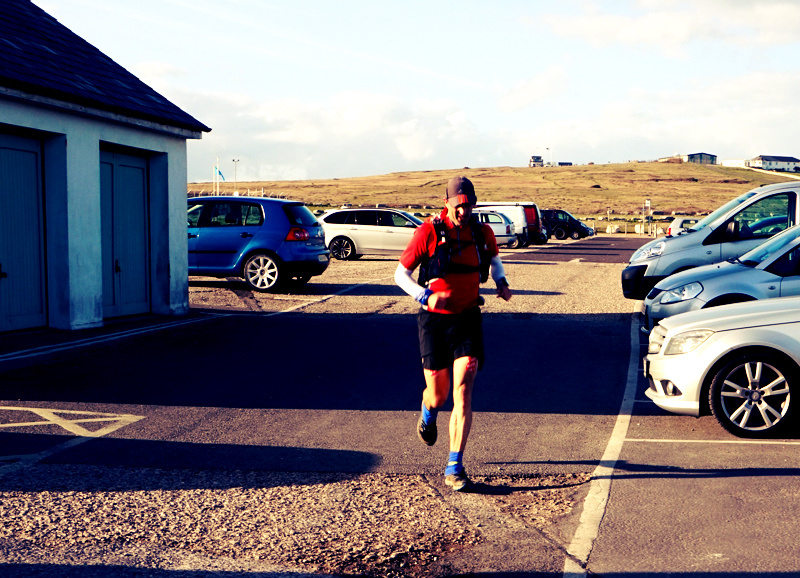 There was one incident a couple of miles before CP4 when a runner ahead appeared to take a detour away from the path. A lady walking her dog mentioned he had gone the wrong way. We looked ahead and saw a flash of the runner in the distance and tried to warn him by blowing my whistle but unfortunately he didn’t hear us and I hope he didn’t go too far off route. I arrived at CP4 (Race HQ) about 26 miles into the race and bumped into Paul Beechey here before topping up my water and heading out. The next section involved a loop of Portland before heading back to the same Checkpoint which would represent the half way point in the race and I was hoping to get that section completed before dark. I trotted on again and walked a short section whilst I consumed some food before carrying on with a bit of a run and eventually catching up with Michael again. 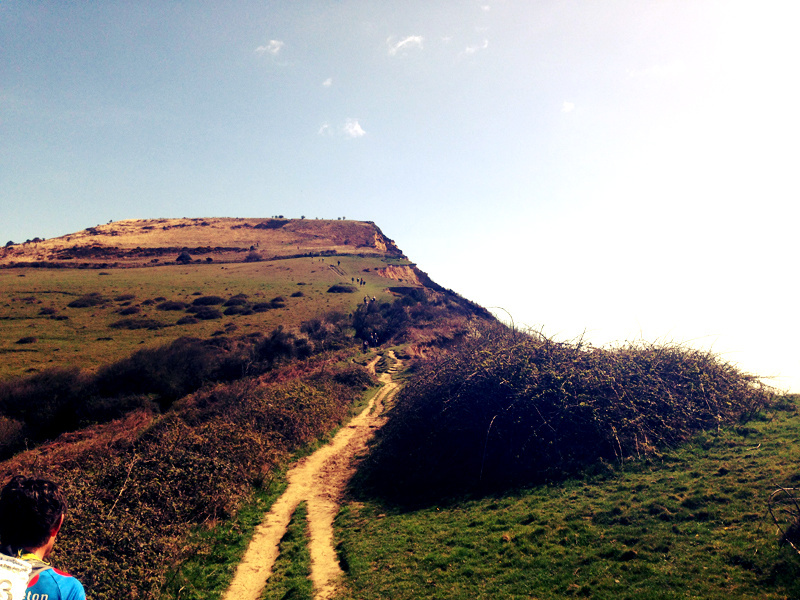 We followed the coastal path around Portland as it rises and then headed towards CP5 at Pulpit Rock Car Park. 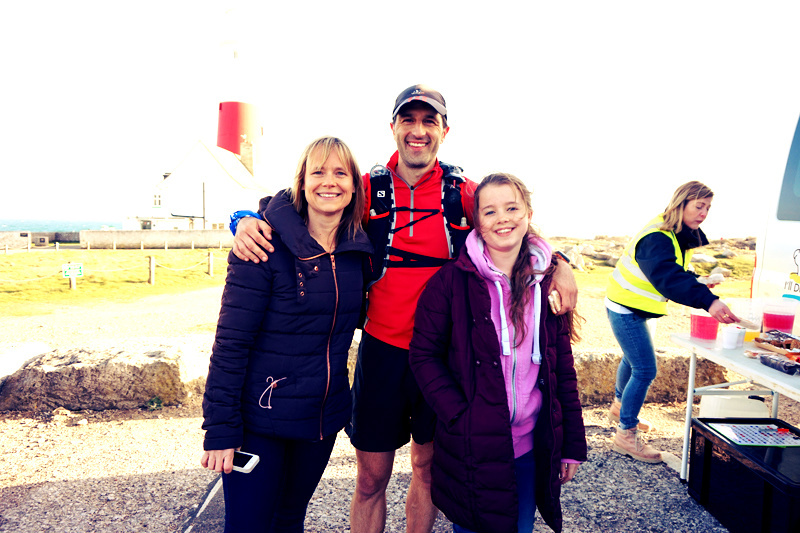 We (the family) had decided to tie this race into a few days away afterwards and we had found a holiday cottage which looked a stones throw from CP5 and Sally-anne, Annabelle and my niece Tia were going to look out for me there. I wasn’t sure exactly where the cottage was in relation to the path but knew it was close. As I headed down the hill to the car park I spotted our car parked next to a house about 200-300 metres to the left and immediately rang the girls to say I was here but there was no phone signal. Thankfully, the girls had the presence of mind to keep an eye on the tracker and were waiting for me at the Checkpoint. I said hello to the girls before carrying on. I was starting to flag energy wise here as I hadn’t been eating as much food as I normally would and grabbed a couple of slices of pizza before continuing on. I was slightly envious of the girls going back the warmth and comfort of the holiday home to be honest but there was a race to finish. I trotted around the next section around Portland as the light started to dim trying to eat the pizza which wasn’t really going down well at all as I didn’t have much of an appetite for food and so ended up nibbling the food and going through an eating process of chewing/swallowing. I had recce’d this section before so knew the two turns from the road back onto the coastal path and the tight left hand turn when you seem to double back on yourself so navigation was going ok so far. At one point I did have to stop to attend to a blister on my big toe. So far, my downhill running technique had consisted of jamming my toes into the end of my shoes trying to slow down when running downhill or battering my quads trying to brake when running downhill. It felt like the toe technique was the preferred method at this stage.. hence the blister. A quick slice of the blister to drain it with enough of a gap so it didn’t reseal followed by a bit of Rocktape as a bandage (I don’t use compeeds any more as they end of sticking to your socks and you can never get it all off) and the toe didn’t really bother me for the rest of the race so early treatment was a good idea. I headed back around Portland towards the Race HQ. I had the route loaded onto my Garmin and was using this as a backup to the coastal path signs to sense check my directions. The GPS route took me back down the main road to Race HQ and not the coastal path which was probably the only point I was conscious I wasn’t following the exact coastal route path. I was definitely running out of steam as I approached the half way point and walked the last mile to the Checkpoint promising myself some hot food and warm clothes before the second half of the race. As the light of the sun started giving way to the darkness of the night and with the slowing pace I started to feel the cold. In fact, I was shivering as I entered the checkpoint and immediately grabbed some hot pasta and a warm drink. I didn’t tarry too long at the Checkpoint but was conscious I was still feeling the cold and had already decided to wear my Montane Fireball Smock (an insulated jacket) for the second half of the race. I also took two hats (a skull cap and a woolly hat) and gloves to keep my extremities warm (i.e. the key areas of heat loss). I marched a mile or so to let my food go down before I started to really feel the warmth of the extra layers and then adjusted a few zips to let in some cool air until I felt comfortable temperature wise. Once again, the Fireball Smock performed really well for me during an event where the temperatures varied between night and day but having a really warm layer which you could zip up for warmth (especially when your pace slows and body cools) when needed or zip down to let in some cool area was of great value. By that time it was getting dark but the head torches weren’t quite needed yet as we were travelling through Weymouth sea front on a Saturday night. Michael and Toby Froschauer had caught up with me and the three of us stuck together for the next couple of Checkpoints. The second half of the run is probably tougher than the first half with more climb and the fact that this is tackled in the night in total darkness. The next two sections were probably my favourite part of the race. Toby, Michael and I chatted the usual ultra talk and we trotted the next couple of sections hiking the ups and running the downs but making some reasonable time. It wasn’t quite midnight yet and I quite alert at this point. We bumped into Paul Beechey and another chap around here but didn’t see too many other people close by but you could see the odd twinkle of a head torch behind or ahead which was comforting…. apart from when you spotted a head torch at the top of the next hill knowing that’s what you had coming up next! We got to the Lulworth Cove section and I was starting to feel very sleepy, I had slipped over a couple of times already and had started to suffer from some waves of drowsiness. It was getting into the early hours of the morning and the worst time of the night for me, coupled with not the best nights sleep meant I was starting to struggle and each hill felt like a mountain. I also noticed I became quite shallow of breath up some of the climbs despite trudging up these quite slowly which felt a little unusual. Michael and Toby went on as I started to slow. I was pretty comfortable on my own and didn’t want to hold anyone back and plodded by myself fighting the occasional wave of drowsiness. Lee (who I had bumped into earlier) caught up with me and we marched together for a while although my pace was slowing and there was little running now to be honest. 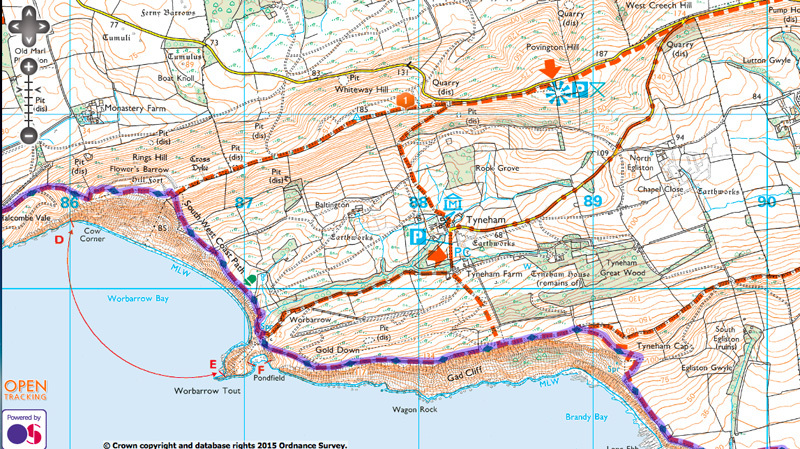 We made our only real navigational issue around Kimmeridge (I think) when we were following the path and looking out for the markers through the firing range. As we got to an intersection we spotted some markers ahead and followed these but missed the ones we should have taken to the right. I also took my eye off the route on the watch and it was only when Lee’s wife happened to check the tracker at some random time in the early hours and phoned him to say he was off course as we realised we had overshot the turn by a mile and then had to double back. A couple of ‘bonus’ miles was no big deal and always likely to happen in a self navigation race. We got ourselves back onto the correct route which was the reminder we needed to be a bit more vigilant and keep an eye on the Garmin. As a minor point, the maps we had been supplied which showed the coastal route wasn’t sufficiently detailed to make out individual paths (but you can download turn by turn directions off the website) and so I had carried a Harvey Map as a backup (along the the route on the Garmin). However, despite this one navigational issue here a combination of following the sign posts and the occasional glance at the GPS route on the Garmin meant navigation was relatively error free despite only having visited the course once before. The route is reasonably straightforward (i.e. keep the sea on your right) and it’s just where the coastal path crosses a few footpaths is where you need to pay attention. As we got into the early hours of the morning my mindset had definitely descended into “CBA” (Can’t Be Arsed) mode and I wanted nothing more than to get to the end of the race by now. I settled into a form of lingering tortuous effort by travelling at walking pace (and this was ‘walking’ as opposed to a quick march to keep the time down) because this was more comfortable than the thought of running but knowing that it was going to take ages to get to the end thus prolonging the overall effort but not quite descending to the stage where you wanted to stop and quit. Despite Lee’s good company and conversation, I was really struggling with the drowsiness and was getting a little unsteady on my feet which resulted in a few more slips. This wasn’t particularly great when you are travelling along coastal paths which were close to the edge of the cliff and when we arrived at the St Aldenheims Checkpoint I decided to have a power nap for about 15 minutes and let Lee know to press on ahead. I sat in the warm minibus and may have dozed for a short while but didn’t manage a proper sleep and eventually roused myself for the penultimate section. The warmth of the mini-bus was a little danger not to get too comfortable and with a half marathon or so to go and I had a quick cup of tea and then pressed on. I felt better for about 15 minutes after the stop but then felt sleepy again and stumbled onwards. Between here and the next Checkpoint it started to get a bit lighter which started to make me feel a little more alert as I followed the path to Swanage. As I got close to St Peverill Point I recall spotting the sun rising above the sea on the horizon and I sat down on a bench for a couple of minutes just to enjoy the view. It’s not very often you have the opportunity to enjoy a moment like that, there was no worries about cut offs and I had wasted plenty of time over the last couple of sections already and I thought why not? I arrived at the last Checkpoint at St Peverill Point, had a cup of tea. I didn’t feel like anything to eat still but was persuaded to try a scone with cheese which went down quite better than I had expected and then set out for the last walk to the finish. The Sunday morning weather was perfect, lovely sunshine and I walked the next few miles enjoying the cool breeze of the air to the finish which was just off Studland Beach. The finish was just off the beach which I thought was a missed opportunity as beach finish photographs would have looked fantastic on a day like today (edit: I’ve seen a few photos of runners along the beach and they look great). They should definitely place the finish right on the beach when the weather is good and it would help being able to spot the finish from further out. I plodded the last few hundred yards to the finish with a wry smile on my face finishing in just under 21 hours 19th out of 48 finishers from 77 starters. 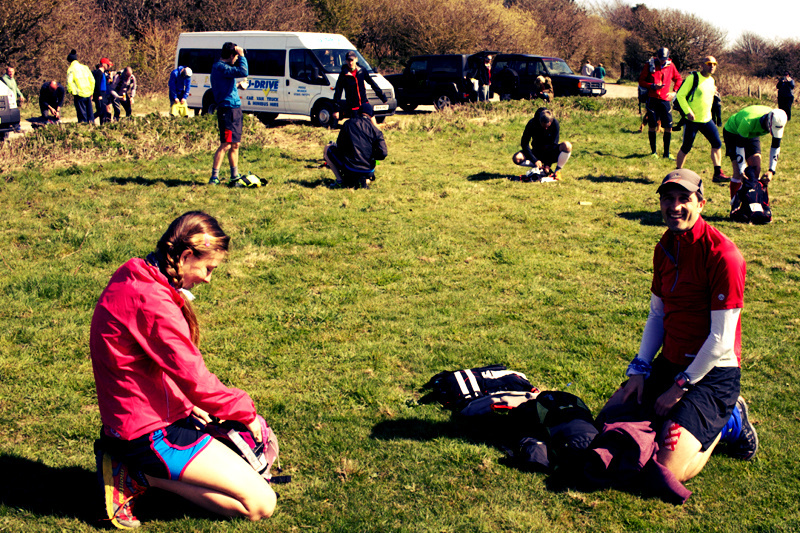 After being awarded my medal and having a cup of tea and some cake, I waited in the mini-bus with a few other finishers or those waiting for transport back for half an hour before we were transported back to Race HQ to retrieve my drop bag and for onward collection. Sally-anne collected me after the race and we’ve had a great couple of days in holiday in Portland afterwards. It was nice being a 10-15 minute drive from the Race HQ which meant I could shower, sleep, eat properly and then relax for the next few days. Thank you to the Brutal events team for a well managed race. The event organisation was good, marshalls were helpful and enthusiastic and good care is taken over competitors safety. The GPS tracking was useful and another good example why more and more events of this nature will start adopting this both from a safety and runners interest view point. Thanks to the few guys I ran with at various times (Lee, Toby and Michael) who were all good company which helped pass the time during the race. Good to meet and spend some time with you all. There’s no doubt that this is a tough course with around 10,000 feet of elevation (which running around the flat roads and towpaths in Reading doesn’t really prepare you for) with some stunning views (unfortunately you miss some of these when tackling the second half of the race at night). However, in terms of my race, the first half was ok but it wasn’t a great run overall to be honest. A major feeling of tiredness really impacted my last third of the race and resulted in my (probably sensible) decision to have a short nap. I then descended into a bit of a “can’t be bothered” mode which was probably the real disappointment here by allowing the negativity to take over and I then took the easy option to walk it in at the end. I didn’t eat my normal amounts of food which probably didn’t help either. Overall, not the best day in the office but managed to finish so ‘job done’. The ‘job done’ is a point I wanted to dwell on. It feels at the moment if I’m going through the motions on these events at the moment. In my mind, I would love to tackle every event head on eventually collapsing over the finish line knowing you have given it your all and then reflect on a satisfactory effort. In reality, I just seem to be grinding these events out with ‘minimum’ effort (i.e. taking the easy option) and I haven’t really been able to recreate the “high” of a race finish or feel any real emotion at the end of a race (the ‘fun hat bet’ during the Winter 100 being an exception). I would be interested in other peoples thoughts here? Do others get mentally ‘jaded’ from races? Hi mate, the Oner certainly has a reputation for being a tough event! Cheers Guy. Going to stick with the GUCR and Spartathlon this year now and not overload the race calendar. Training for those should keep me motivated and busy. Hey Paul, firstly thanks for the stash man!!!! My bro wondered what I’d really been up to for the night when he saw my glow sticks and bag of S-Caps. Looking forward to giving them a go before SDW 100 in June. This was my second shot at The Oner and that certainly makes it no easier. Maybe mad enough to come back for more, but that brings a little complacency, the “yeah, I’ve done it before” attitude but still having a time to beat, so adding myself as another competitor! I too could have done with more time on my feet beforehand, I trained to feel but it wasn’t enough. More 5am starts required! After Kimmeridge I had 3hrs in the bag, I know I should have run more and really wanted to get inside 20hrs this year, I managed 21hr15, a whole 53m quicker than last year! There was no way that I was running that beach, I just couldn’t be bothered by that point. last weekend was a wake up call for me for where I really need to be for SDW if I want to get inside the magic 24hrs. More 5am starts required! Good luck for your other events this year, especially Spartathlon!! Thanks Jon, nice to meet you. Good luck with your future events! Hi Paul, do you think the ‘Run until you drop’ event is still taking its toll, mentally if not physically. The winter 100 was a great event for you, maybe you need to target a few events and really push hard, and use the other long events as preparation? First, let me just say that grinding out any race at that distance is an achievement, so well done. I first read your blog that you’d done on the grand canal race in Birmingham. It was brilliant, I used to live near there but now am in Chicago. Not sure if I’m experienced enough to give an opinion ( 6 marathons and a 50k) but maybe some short races might give you something to look forward to. 10k’s and up. Half marathons are a great race to run and still feel good enough after to enjoy the occasion. Anyway don’t want to take up any more of your time as I’m sure your lacing up your shoes and ready to get out again. Thanks again for your blog, it’s a great read. Thanks Dean, shorter races… they hurt! Surprise surprise I’m running the GUCR again in May and then Spartathlon in September both are events I have really enjoyed for different reasons in the past. Therefore, I’m going to keep the diary free of other long events and focus on these two.